The civil war underway in Syria since March 2011 has changed the Syrian nation beyond recognition, and the shockwaves caused by the war have made a very strong impact, both in the Middle East and beyond. Following four decades of relative stability, Syria has become an arena marked by internal, regional, and international conflict. The weakening of the central government in Damascus, along with the transformation of Syria into a battlefield featuring many actors with different and often conflicting interests, poses new challenges for Israel. In the uncertain reality marked by the multiplicity of hostile actors, there are also opportunities for Israel to strengthen and possibly forge ties with pragmatic Sunni opposition and minority groups with whom it shares specific interests. 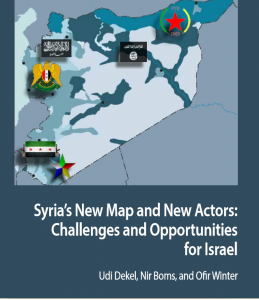 This memorandum surveys the main actors currently operating in Syria, especially in the southern portion of the country; analyzes their attitudes toward Israel; and formulates recommendations for a new, proactive Israeli policy in the dynamic Syrian arena. It proposes modes of military, political, economic, and humanitarian action likely to serve Israel’s strategic interests. Chief among these interests are the need to maintain tranquility on the Golan Heights and the need to prevent the entrenchment of “negative” players on the Syrian side. For the full report, click here.